That westerly has hit now boy oh boy there's some instability with this gusting winds swirling mid level structures fast moving scud and fair bit of lightning.Cant believe planes are still taking off into it. Dust is on its way now with predicted gust up to 70 km/h as the afternoon continues. You can see it on the Sat imagery Mega posted. No reprieve from the heat either, if anything it will warm up again. Lets hope there is no fire. This heat and winds would produce major firestorm. heck of a system and its fairly flying along, an hour ago at northgate it was 34c & belting down , felt like fiji , another hour and it will feel like the sahara. 38kt wind gust Toowoomba 1pm. Plenty tree bending going on here atm. Consistently gusting 40-45 km/h here. Max I've recorded so far is 64km/h. This is in a backyard surrounded by plenty of trees and the house "blocking" the wind coming from the west. Watching the palms bend and swirl around is similar to when a good thunderstorm comes through. Just without the water, sadly. Oh great, now we lost power. No aircon, no fan, nothing. Many places have recorded well over the predicted 70km/h already. By 70km/hr, are you referring to modelled gust speeds or the wind speeds in the official forecasts? The 117km/hr gusts at Double Island Point appear to have been caused by the storms that went over it at that same time. CURRENT WEATHER...........2/8 cloud - decreasing. TS 1225 - no hail. Passage of trough 1358. Anyone think the dust will make it here before sunset? It's struggling to get a move on to the coast. Would be a spectacular sunset if it came in time. I was just going by the forecast Ken. I am once again on my iPad and it is pretty restrictive when trying to move around the models etc. The laptop is going in for a tune up and my main Computer is almost ironed out. I was hacked, I bypassed their virus, quarantined it, destroyed it but now just resetting everything. Mongrels. Yeah the 117km/h was the storm which was amazing watching the Doppler. Once it hit the Ocean and Bay it bombed. I wouldn’t be surprised there was a water spout or 2. As I am tapping this out I reckon we must be hitting 80km/h here. It is howling. Yeah lots of lightning with it as well. Close to 30,000 without power now in SE QLD now and numerous reports of powerlines down with some other assorted minor damage. 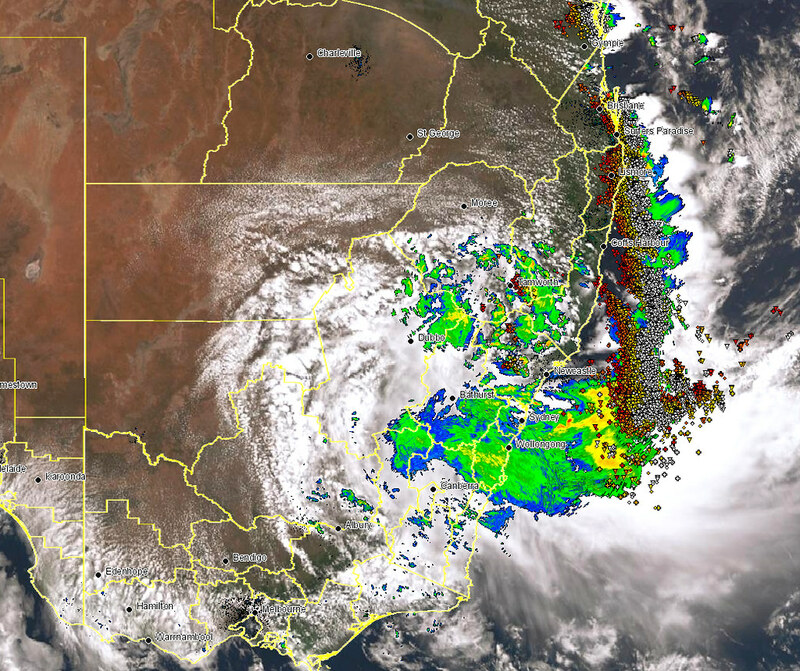 The satellite/lightning image taken when the storms were sweeping across coastal SE QLD looks pretty speccy too (image via The Early Warning Network). Some of the dust marching across the southern interior appears to be somewhat visible towards the distant SW on the Toowoomba Airport webcam as well. Sunny coast in a major donut hole! Cruel. What a massive system this is. Across at least 4 states looking at the image Ken posted. NSW the worst affected followed by QLD. My wife is stuck in town. Tree took out the train lines in both directions. 43kt gust at Toowoomba from BOM obs. looking at the obs for Brisbane Airport. From about 12pm until now.. 10 degrees hotter, that westerly sure is hot. Check out the aircraft tracks into BNE. Never seen such big wobbles. Must be like a roller coaster. Impressive. A 89kph gust at Amberley. A question, is today similar to the classic "dry line" thunderstorms that occurs in the USA? 4 registered (petethemoskeet, Adaminaby Angler, crikey, Dan101), 59 Guests and 3 Spiders online.